Renown for its beautiful beaches and indented coastline, Kefalonia is only 50km long by 25km wide. The island suits anyone seeking stunning scenery and a relaxed atmosphere. 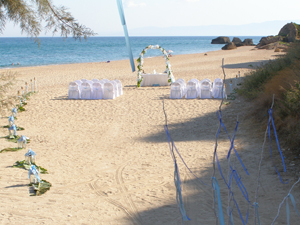 Here are two gorgeous venues for couples seeking the perfect beach wedding in Kefalonia. Minies beach, some 7km south of Argostoli (the capital of Kefalonia) and Skala beach on the southern tip of the island. 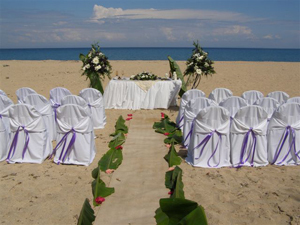 As shown on the photographs above, covered chairs, a table and a flower arch can be set up for your right-on-the-beach ceremony. Of course, we'd do our utmost to also provide any other decorations you may have in mind - so, please ask. 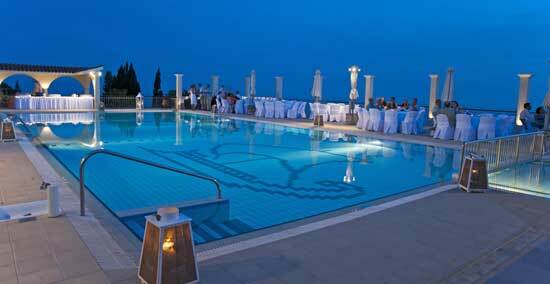 And we'll suggest some tempting ideas for your reception too, no matter whether you prefer a local taverna or the hotel you're staying at. we will avoid booking weddingsduring this period. 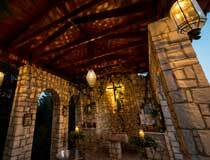 Part of the 3-Star Mouikis Hotel Sun Village located inland in Lakithra (close to Lassi), St Christopher's Chapel is a very pretty wedding venue. It is suitable for small groups and covered chairs can be set up for your guests to enjoy the ceremony that takes place on the sea view terrace. Once you have exchanged your vows and posed for photographs,we could arrange for a few drinks to be enjoyed on the terrace. 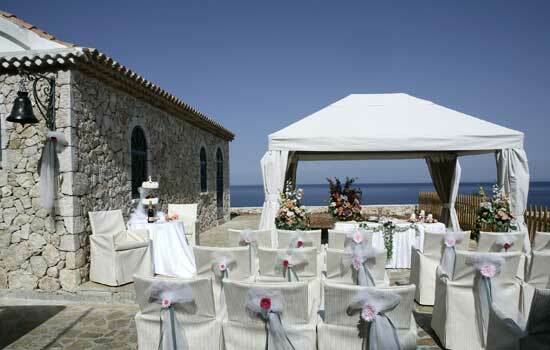 Similarly, your reception can take place at the hotel or indeed at a local taverna. 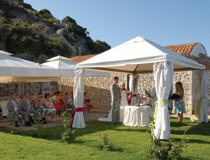 In Kefalonia , the official civil wedding is conducted in the nearest Town Hall to your holiday accommodation. This is a short service that is read in Greek and translated in English and it lasts about 10 minutes. 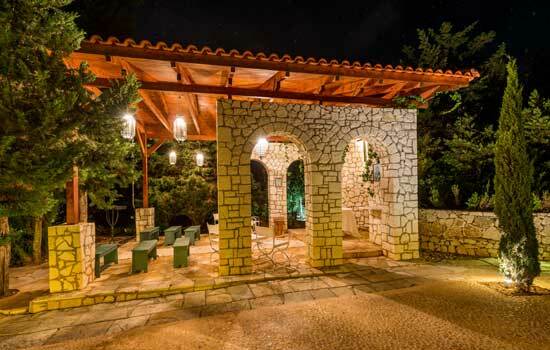 We will be able to suggest a variety of hotels in Kefalonia and give you all the advice you need on transportation, flowers, receptions venues, etc. 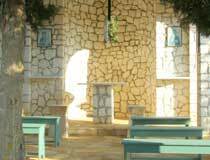 If you choose to stay at the Apostolata Resort & Spa, we could, after your official wedding at the Town Hall, organise a follow-up ceremony at the hotel under the pretty gazebo that stands by the on-site chapel. It is a panoramic setting and an ideal way to enhance your wedding and share your special day with friends and relatives. 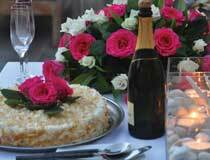 Don’t hesitate to discuss with us the many possibilities for a splendid reception at the hotel. • Breakfast in room after wedding night • Free accommodation for bride & groom if you book a minimum of 10 rooms at the hotel. 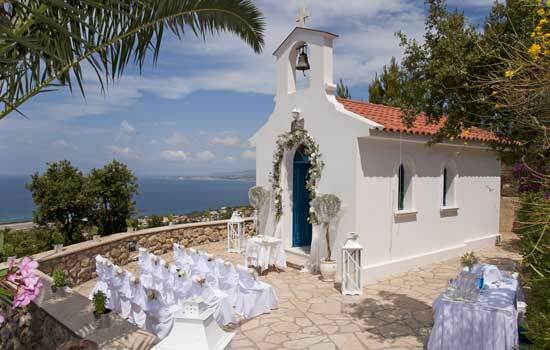 Located just outside Fiscardo and boasting wonderful sea views, Emelisse Art Hotel guarantees a bespoke service for all the arrangements relating to your wedding, from the initial planning up to the important day itself... plus of course, your honeymoon. 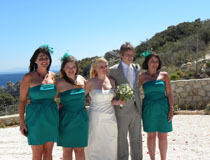 A variety of excellent packages are available for you to choose from and the options for your cocktail party and/or reception are just as tempting. 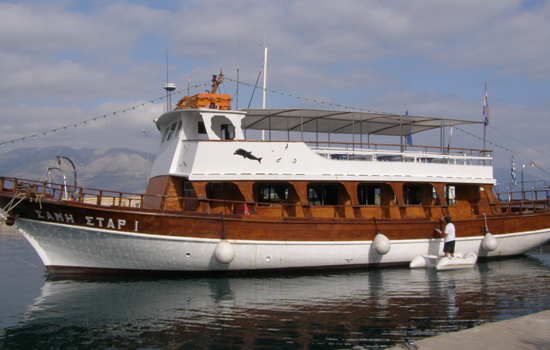 Impress your guests with an invitation to join you on board a wooden Greek boat in Kefalonia to witness your wedding ceremony. Yes, that's exactly what's in store for you when you choose this very picturesque venue for your special day. The sailing trip can of course include a few drinks and nibbles to toast the happy couple! For couples who do not need another toaster. to carry your wedding dress. Everything to make your day as individual as you wish it to be. 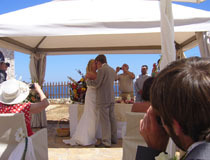 Planet Weddings is part of Planet Holidays. Planet Holidays is a member of ABTA (Association of British Travel Agents) - membership No W6455. all monies collected in the UK in relation to 'accommodation only' and 'wedding only' arrangements. As all members of AITO (Association of Independent Tour Operators), Planet Holidays is also committed to high standards of service and is required to adhere to a Code of Conduct which encourages high operational standards and conduct. For further information, please click on logos.